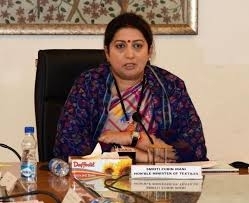 The Congress Thursday accused Union minister Smriti Irani of "fraud and bungling" in MPLADs funds in Gujarat while citing a CAG report and demanded her immediate sacking from the Narendra Modi government and lodging of a case against her. Congress leaders Randeep Surjewala and Shaktisinh Gohil claimed the CAG has said that she has made payment of Rs 5.93 crore from MPLAD funds without tender including fraudulent payment of Rs 84.53 lakh. No immediate comment was available from Irani or her office on the charges. Irani, the Union Textile Minister, selected Anand district as her nodal district for implementation of works under the MPLAD scheme. "Audit observed that the selection of the NGO (Sharda Majoor Kamdar Co-operative Society), as implementing authority was in contravention of the scheme guidelines and government instructions, as no tender procedure was followed for its selection," reads the report. Reporting the matter to the Bharatiya Janata Party (BJP) government in Gujarat, the CAG recommended investigating all the works by the NGO. "Since the tendering process, the scope of work awarded and payment processes were violated, therefore audit is of the view that these works are susceptible to fraudulent and irregular payments. "Audit recommends that the State Government should investigate all the works carried out by the NGO and fix responsibility on the Government officials responsible for the negligence. The matter was reported to the Government (September 2017). A reply is awaited (February 2018)," the report added. Congress Gujarat MLA and spokesperson Shaktisinh Gohil said the NGO selected by Irani is supposed to be a co-operative society of construction labourers, but all the members actually belong to the BJP. Gohil also referred to a letter by the Anand district collector written on June 20, 2017, to the Deputy Secretary, General Administration Department, Gujarat pointing out the irregularities and the fraud being committed under the grants received under MPLAD. Gujarat Congress President and MLA Amit Chavda has also filed a PIL in the Gujarat High Court demanding an FIR against Irani.